The culmination of the combat training year in Russia’s Armed Forces results in an annual operational-strategic military exercise involving air, land and sea elements to test forces in one of four theaters: these are the rotating Kavkaz (“Caucasus”), Tsentr (“Center”), Zapad (“West”) and Vostok (“East”) exercises. Similar to the others, the every-four-years Vostok drills use complex scenarios to test Russia’s military capabilities in its eastern strategic direction. However, in August, the minister of defense, Army General Sergei Shoigu, announced that Vostok 2018 will involve forces from Mongolia and China. The latter marks the first inclusion of People’s Liberation Army (PLA) units in a Russian strategic-level military exercise. Combined with the Sino-Russian dimension to Vostok 2018, Shoigu also promised that the exercise, staged during September 11–15 on training grounds in the Central and Eastern Military Districts (MD), will be the largest such maneuvers since the Soviet–Warsaw Pact Zapad 1981. Nonetheless, some of these claims may well be exaggerated; there are sparse details regarding the PLA’s involvement or about the precise nature of this year’s exercise scenario (RIA Novosti, September 4; Rambler.ru, August 30). Some background to the significance of these exercises from Moscow’s perspective is needed to contextualize and evaluate the importance of China’s participation in Vostok 2018. Each of the annual operational-strategic exercises (Kavkaz, Tsentr, Zapad, Vostok) are designed to test Russian forces and capabilities in specific theaters of operations, with extensive preparation of participating units prior to the actual exercise. For example, ahead of Zapad 2017, Russian units were being pre-deployed for training in Belarus as early as April 2017. These included airborne forces, engineering specialists and electronic warfare (EW) units (see EDM, July 11, 2017). Moreover, the scenario and planning for operational-strategic exercises is worked out by the General Staff months in advance. It is highly unlikely that PLA participation—making Vostok a bilateral exercise, albeit with small numbers of additional troops from Mongolia—was a last-minute decision; it probably involved extensive dialogue between senior military staffs in Beijing and Moscow. While the focus of Vostok 2018 will be on training grounds in the Eastern MD, it will also extend to cover most units located in the Central MD. According to the Commander of the Central MD, Lieutenant General Alexander Lapin, many of his units will actively train during the exercise. He added that the “unprecedented” scale of the exercise will also see the use of “new forms and methods of combat” based on lessons drawn from Russia’s operations in Syria (Rambler.ru, August 30). Much of the Russian military media reporting in advance of the exercise highlighted Shoigu’s claims concerning the massive scale of the war games. Allegedly, this will witness the use of 1,000 aircraft, helicopters and unmanned aerial vehicles as well as “300,000 military personnel.” It is not unusual for the defense ministry to resort to hyperbole in reporting strategic exercise numbers, with an underlying message of “bigger and better” (Tvzvezda.ru, August 21; see EDM, September 4). Reportedly, among these large numbers, 3,200 PLA military personnel will swell the overall figure; the disbalance, even allowing for inflated figures on the Russian military involvement, should be noted. In other words, Vostok 2018 essentially remains a Russian strategic exercise, but with a small-scale bilateral component. It is also interesting to compare this year’s eastern theater drills with the western-oriented Zapad, which is in fact a Russia-Belarus combined strategic exercise (sovmestnoe strategicheskoe uchenie): reporting on Vostok 2018 never mentions that key phrase. Yet, it does remain significant that Moscow and Beijing have agreed to carry out at least a partly joint strategic-level military exercise for the first time. 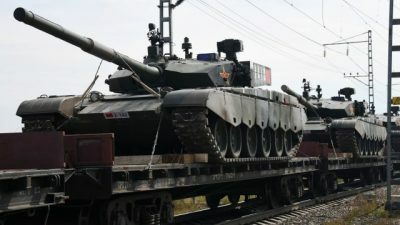 Some clues about the inclusion of PLA forces have surfaced in Russian military press coverage, noting that the act of reaching out to foreign partners significantly expands the “geography, boundaries and horizons of the exercises” (Tvzvezda.ru, August 21). In addition to forces drawn from the Central and Eastern MDs, Russia will also use the Northern and Pacific Fleets, as well as the Aerospace Forces (Vozdushno Kosmicheskikh Sil—VKS). It appears that the VKS has been at the forefront of preparations for Vostok 2018. In June, Colonel General Sergei Surovikin, the commander of the VKS, said the focus of the summer training period centered on Vostok and the need to bring units up to higher combat-readiness levels ahead of the exercise. Surovikin explained that up to 50 percent of the summer training would be at night. He noted that VKS training focused on “ensuring coordination with combined-arms units, units and formations” (TASS, June 4). VKS exercises have involved additional training for pilots of Su-30SM, Su-35S and MiG-31 fighters; among other features, these rehearsed landings on damaged airstrips. On August 15, combat aviation crews trained to land on the Khabarovsk–Komsomolsk highway. Long-range aviation has also drilled ahead of Vostok. This included two Tu-160 strategic missile bombers landing at the Anadyr airfield (the closest such air strip to the maritime border with the United States) during an exercise (Nezavisimoye Voyennoye Obozreniye, August 16). By contrast, scarce details emerged regarding naval preparations for Vostok 2018. In late August, however, the commander of the Pacific Fleet, Admiral Sergei Avakyants, speaking in Vladivostok, suggested changing the name of the region. “We have long ago abandoned the term Far East. It is not far, it is just the east of Russia” (Rossiyskaya Gazeta, August 27). Another area where information on the exercise seems to be lacking relates to the scenario itself. With China sending forces to the Vostok exercise for the first time, many experts in Russia and in Western countries have speculated that the hypothetical opponent is the US, which, indeed, seems probable. The head of Russia’s Main Directorate of Combat Training, Lieutenant General Ivan Buvaltsev, noted that the exercise scenario involves a whole range of hostilities that fits into a single plan (Rossiyskaya Gazeta, August 27). Yet, at the same time, this is nothing new in Russian strategic exercises, and he offered no further details on the nature of the scenario. Vostok 2018 is receiving more publicity and international attention than earlier iterations of the exercise precisely due to the involvement of the PLA. Many areas concerning the substance of the exercise are under-reported, however. The disparity in numbers between Russian and PLA forces, together with the lack of use of the terms “combined” or “joint” exercise, may be telling. Equally, while Russian officials, experts and media tend to talk up Vostok 2018, Beijing by contrast is downplaying it. As the exercise unfolds, the specifics of PLA involvement and the scenario being rehearsed may offer answers to these questions.